LENOX — On Sunday afternoon, a pair of friendly BSO volunteers stood on the path between Ozawa Hall and the Koussevitzky Music Shed, armed with hand-held ticket scanning machines. They were presumably there for the simple purpose of ensuring that only ticket holders for the BSO’s matinee concert were able to gain access to the Shed. But their presence like guards at a border checkpoint also underscored the sense of metaphorical separation between the two centers of activity at Tanglewood: the BSO and its summer academy known as the Tanglewood Music Center. Indeed, these spheres rarely feel as remote from one another as during the summer’s annual Festival of Contemporary Music. Over several days in Ozawa Hall, the FCM focuses mostly on the works of living composers, while the BSO continues with its populist bread-and-butter programming just up the path. During his time as the BSO’s music director, James Levine dreamed of narrowing this gap by involving the entire BSO in one FCM concert annually. What better way, he argued, to show that contemporary music was also a priority of the highest rank for the institution as a whole? Levine’s vision was realized for one summer during the all-Elliott Carter edition of FCM, but not since. What’s more, for years a single work by a living composer would appear on the weekend’s BSO Shed programs, specifically designated as the orchestra’s official contribution to FCM. Mysteriously, even that token contribution has now slipped away. All of this said, the entire array of the BSO’s new music activities should soon be receiving a jolt of sorts, as the estimable British composer Thomas Adès takes up a newly created “artistic partner” position with the orchestra this fall. Adès will also direct FCM for at least the next two summers, and it will be fascinating to see what becomes of the festival under his watch. One hopes his arrival can mark the beginning of a fresh integration between the orchestra’s essential new music commitments and its larger performance mission. The FCM concerts offered this weekend were rewarding in their own right, and consistently maintained the high performance standards this festival has set for itself in the past. Programs this year were curated by the composer Steven Stucky, whose death of brain cancer in February of this year came as a shock to even his closest colleagues. In his introductory program note, the BSO’s Robert Kirzinger observed that “by humbling, unpredictable coincidence” the music on these concerts spans, almost exactly, the lifetime of their curator. The works across Stucky’s six programs did not trumpet any overarching themes, nor did they seem intent on making any partisan revisions to received narratives of the recent musical past. Rather, they grouped themselves around clusters of influence, pedagogic and musical, across different generations. Friday’s quartet-centric program stated this most simply with its opening work, the String Quartet No. 1 by British composer Joseph Phibbs, himself a former student of Stucky’s, which took the idea of influence itself as a subject to be explored, not as a source of “anxiety” but of inspiration. In this attractive score, ghosts of string quartet masters past are not banished but seemingly invited in to join the banquet. It was followed by Hans Abrahamsen’s Third Quartet, in an often hushed and mesmerizing performance. On the same program, the composers Sebastian Currier and Donnacha Dennehy both reached out beyond the standard string quartet configuration. Currier, in his “Deep-Sky Objects” reaches way beyond, to sketch a vision of intergalactic romance, as electronics built from actual space sounds punctuate luminous settings of evocative texts by the poet Sarah Manguso, strikingly sung on Saturday by Sophia Burgos. Dennehy, in his “One Hundred Goodbyes” uses samples from old Irish field recordings of vanishing Gaelic folk songs to underscore the haunting presence of the past. 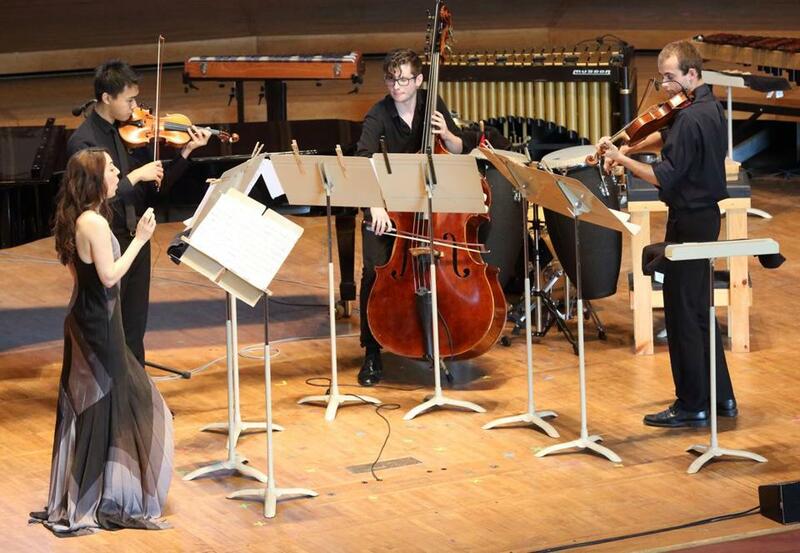 In Friday’s performance, this year’s excellent New Fromm Players — Natsuki Kumagai and Jordan Koransky (violins), Mary Ferrillo (viola), and Francesca McNeeley (cello) — conveyed this music’s sense of awe in its own found materials. Highlights of Saturday’s program included Donald Crockett’s taut, lively “Whistling in the Dark” as well as the premiere of Erin Gee’s “Mouthpiece 29” for voice and string instruments, a work that gleefully splashes around in the possibilities of vocalism freed from the burdens of signification or language. Gee herself was the vocalist here, deploying a wide range of extended techniques that turned her voice into a protean instrument capable of conversing with any member of a trio of strings (violin, viola, bass) as if speaking in a native tongue of her own invention. Sunday morning’s concert opened with elegant clamor courtesy of Anders Hillborg’s Brass Quintet, and also included a Sextet (“Old Kings in Exile”) by Brett Dean as well as Jonathan Harvey’s “Song Offerings,” a group of lapidary Tagore settings for soprano and mixed chamber ensemble. In the latter work, soprano Sarah Tuttle beautifully captured the pointed, calligraphic quality of Harvey’s glinting vocal lines. And mezzo-soprano Quinn Middleman made a similarly persuasive case for Harold Meltzer’s “Variations on a Summer Day,” a gleaming setting of texts from the Wallace Stevens poem of the same name. The music of Pierre Boulez was also represented by a rewardingly detailed performance of his “Dérive 1,” presented here in the composer’s memory. Boulez was of course a student of the towering French composer Olivier Messiaen, as was the composer George Benjamin. These threads will be drawn together in the FCM’s final concert scheduled for Monday night, and set to include a keenly anticipated pairing of Messiaen’s iconic “Turangalila” Symphony with the US premiere of Benjamin’s “Dream of the Song.” The festival tends to end with a major flourish, and this year should be no exception. Jeremy Eichler can be reached at jeichler@globe.com. Follow him on Twitter at @Jeremy_Eichler.